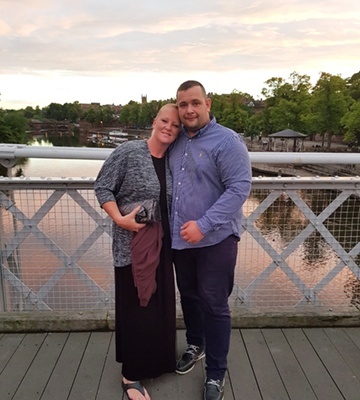 In October 2017, Kieran now aged 32 was working as a crane supervisor when he was struck by a piece of heavy plant on site. He was knocked unconscious and when paramedics arrived he was unresponsive. He was rushed to hospital where it was discovered that he had severe concussion and a significant shoulder injury. Due to Kieran’s loss of wages, he was not able to pay everyday costs such as rent and food and the family were at serious risk of being evicted. To make matters worse, their upstairs ceiling was damaged as a result of a leak and so Kieran, his partner and their 4 children aged between 1 and 14 were all sleeping on mattresses in the living room. As Kieran was in arrears with his rent, the landlord stated that if Kieran was to pay for the repair costs then the overdue rent would be waivered. The relief was short lived because Kieran still had no way of paying for the repair. Then he found out about the Lighthouse Construction Industry Charity. Our Wellbeing Volunteer visited Kieran and his family in December 2017 and witnessed first hand the turmoil they were in. The situation was not only hindering Kieran’s recovery, it was also causing serious emotional stress and pressure to everyone concerned. We helped Kieran and his family by paying for the repair works and providing a monthly sum to help with daily living costs which alleviated some of the stress and worry the family were experiencing. Kieran says “If it wasn’t for the Lighthouse Construction Industry Charity helping us we would be homeless. I felt desperate and so worried that I was going to lose my home that I couldn’t sleep. The financial support from the charity has allowed me to concentrate on getting better without the added stress of not having enough money to feed my children and making sure we are all in a safe home. Thank you”. If you’d like to know more about how you can support our work and help people like Kieran, visit our Support Us page.